THIS SIMPLE BUT ELEGANT-LOOKING RING MADE OF TITANIUM CONTAI - ProudMummy.com the Web's Community for Mums. 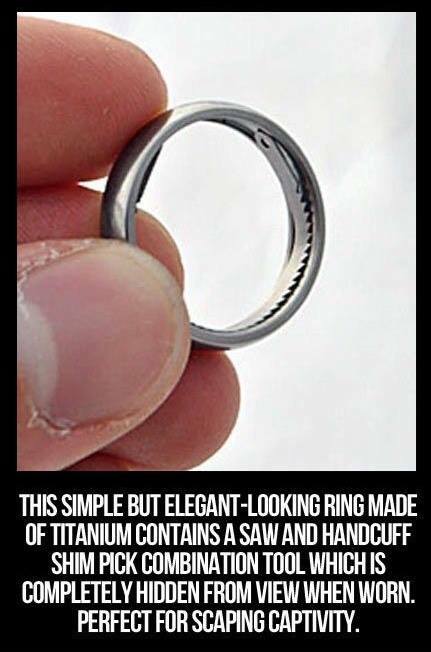 THIS SIMPLE BUT ELEGANT-LOOKING RING MADE OF TITANIUM CONTAINS A SAW AND HANDCUFF SHIM PICK COMBINATION TOOL WHICH IS COMPLETELY HIDDEN FROM VIEW WHEN WORN. PERFECT FOR SCAPING CAPTIVITY.